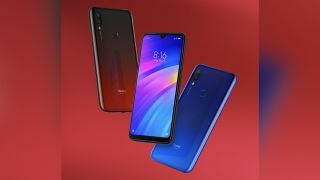 On the heels of its launch in India, the Redmi Note 7 Pro has been launched along with the Redmi 7 by Xiaomi in China. The Redmi 7 succeeds Redmi 6 which was one of the bestselling budget smartphones in India last year. While there is no official word on the launch of the Redmi 7 in India, we wouldn't be surprised if the company launches it here in the next couple of months. From a 5.4-inch 18:9 aspect ratio display on the Redmi 6, the Redmi 7 features a bigger 6.26-inch HD+ (1520 x 720 pixels) display with a u-shaped notch that we have previously seen on Redmi Note 7 series. This makes for an 83% screen-to-body-ratio thus providing a bigger screen estate to users. The Redmi 7 features a dual camera setup consisting of a primary 12MP camera with an aperture of f/1.29 and a secondary 2MP depth-sensor. The notch on the front houses an 8MP selfie camera. Xiaomi has also incorporated several AI-based features like scene detection, Beautify mode among others to ease the process of creating pictures from the camera. It also has a fingerprint sensor embedded onto the polycarbonate rear panel and will be available in red, black and blue colours. Redmi 7 is powered by a 4,000mAh battery to boot. Redmi 7 is priced starting at 699 Chinese Yuan for the base variant which has 2GB RAM and 16GB storage, 799 Yuan for the model with 3GB RAM and 32GB storage and 999 Yuan for the 4GB RAM variant with 64GB storage. Seeing its price in China, we expect the company to price it similarly under Rs 10,000 when it launches in India.